It turns out I am, quite literally, HUGE in South Brisbane. 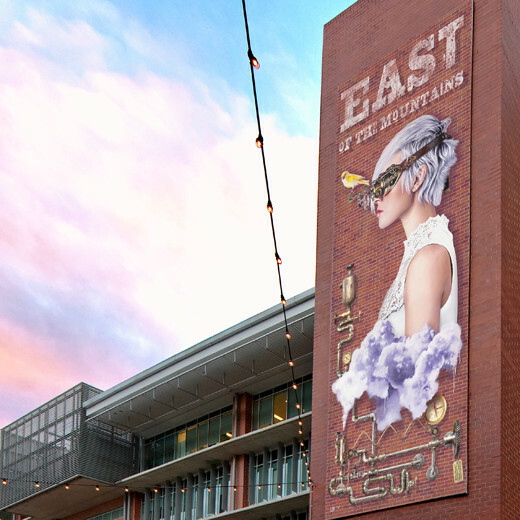 Earlier this month I finished work on two 10.5m high x 4m wide murals now installed on the east and west brick pillars of 99 Melbourne St, South Brisbane, in the heart of the lively cultural mecca Fish Lane precinct. ‘East of the Mountains’, featuring an adaptation of my ‘Insurgent’ self portrait, and ‘West of the Sea’, featuring Mr George Fish (1851-1925), namesake of Fish Lane. The west and east portraits face each other, each looking out through their extraordinary eyewear as if seeking one another – as past might seek the future, and as the present might look to the past. This engagement embodied by the two pillars reflects the unique social nature of the precinct. Fish Lane, and the greater West End/South Brisbane area, is a place when people come together for rich blend of culture, creativity and company. George Fish; entrepreneur, champion of South Brisbane, purveyor of steam, namesake of Fish Lane and proprietor of quite the most marvellous Victorian beard. If ever a notable figure in Brisbane’s past suited an interpretation in the steampunk aesthetic, it would appear to be our Mr. Fish. Here he is, nestled fashionably in his fish bowl, atop a fascinating system of pressurised mechanica – where water and energy combine with a pinch of magic. To the east the artist appears, his future counterpart, as if born of that very steam like a genie from a bottle. In keeping with the unique ethos of the West End/South Brisbane area, it was important to me that the artwork I created for this project sat organically in situ as if each piece had grown in place, a product of its location, rather than something imposed upon it. This has been achieved by employing brick as the background for each subject, ensuring that no hard lines or banner edges will define where the work begins and ends. …born from the idea that regardless of eras, of fashions or developments, their are fundamentals to a location that will always remain constant. Therein lies a timeless witness to the tapestry of life and change – a link to all for whom a particular place has meant something special. ‘West of the Sea’ and ‘East of the Mountains’ by Lix North, captured at twilight by photographer Mike Richards during the 2017 Fish Lane Festival. Sine wave – Within each work’s intricate web of steam pipes and fantastical pressurised systems there is an expression of the sine wave pattern, a thematic marker specific to block 2 of Fish Lane and part of the Fish Lane Art Program initiative. Gold Fish – A beacon of colour in the murky depths of the fish bowl, a goldfish swims as a visual accompaniment and talisman to Mr George Fish’s portrait. Compass and Postcode – At first glance there would first appear to be steam pressure gauges in each composition. Look closer to find that they are actually compasses set to mark the direction appropriate to each pillar. The smaller second gauge on the East Pillar artwork reads pressure increments of 100, 200, 300 with the South Brisbane postcode ‘4101’ as the final increment. Poem – The complete poem from which both works draw their titles is hidden in each piece. In the West Pillar work it sits at the bottom of the fish bowl, on the East Pilllar work it hangs from the valve release in the bottom right corner. 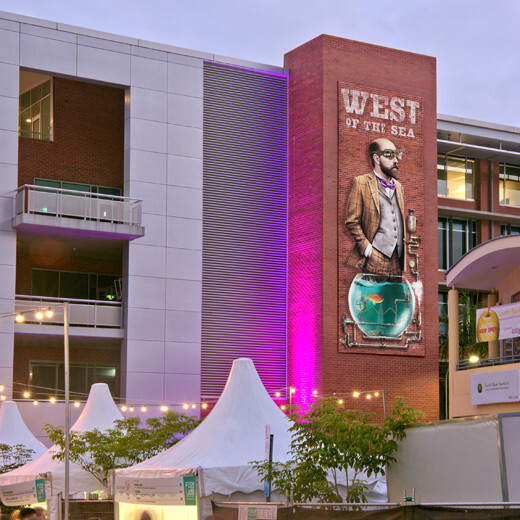 A big thank you to Craig Flood and the team at Creative Move and Aria Property Group for the opportunity to create these two pieces for such an awesome location, and to Matt Horn and the Flash Graphics Brisbane team for doing a killer job with the installation. If you’re in South Brisbane and snap a photo of either mural tag me, @lixcreative on Instagram, Twitter and Facebook, I love seeing your pics! Ltd Edition fine art prints of both works on paper will be available to purchase (framed or unframed) through Onespace Gallery Afterimage Editions from December 6th – 22nd, 2017.